CUCET Syllabus 2019: Through CUCET you can get admission into UG, PG and Research Programs. Universities offer UG Courses such as B.Tech and B.Sc, PG Courses such as M.Tech/MCA, MBA, and Integrated course, and many more. To get admission into these courses candidates have to appear in the CUCET 2019 Exam. To Participate in CUCET Exam, candidates have to fill application form and do their preparation. The Exam Authority will release the syllabus for the exam on the official website. We do not want you to wait until the release of the official syllabus or CUCET Exam Pattern, that’s why we have prepared this article to provide you with all the stuff for your preparation. The CUCET is a multi-universities exam composed at the national level. Every university has its own rule, regulation, pattern, and changes. So to keep things easier to understand and manageable, the authority tries to keep the CUCET Exam Pattern very basic and probably common. Subjects Physics, Mathematics, Domain knowledge and language Proficiency and General Awareness, Mathematical and Analytical skills. For admission into Integrated courses/ MBA/ LLB/or any other general courses, There will be only one paper having 100 MCQs, will be held. Candidates will have to attempt any ¾ sections From the Part B of the exam. Read more instructions which will be given in the exam paper. 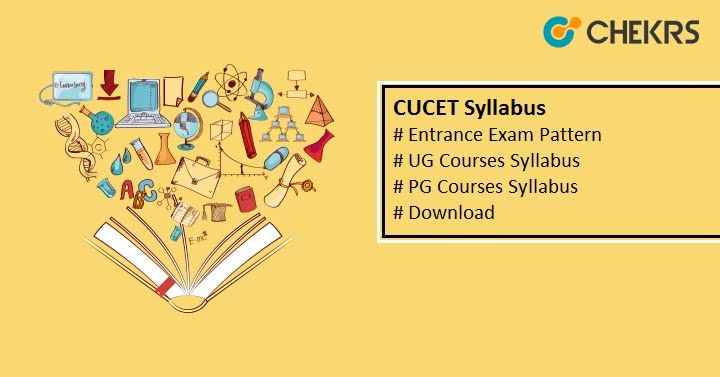 After Exam Pattern here we present the CUCET Syllabus for PG Courses as well as UG and RP programs. The Official Website provides syllabus before the exam with the form or notification. There will be no major changes in the Every year’s Syllabus. So you can start your preparation by going through the available syllabus. Go to these Links According to your program. After it, Click on the Respective Code Link. You will access the CUCET Syllabus pdf of your desired Course. On the Same PDF, Official CUCET Exam Pattern will be also visible. Check all the details and start your preparation. CUCET Exam provides the gateway to get admission into well-reputed Universities. You can Grab this chance by doing a solid preparation. CUCET Syllabus, as well as Exam Pattern, Model Papers will be useful in it. So don’t waste your time and start your preparation from now.